Lasting between July 17th 1942 and February 2nd 1943, the Battle of Stalingrad was one of the single most bloody and brutal military conflicts ever. Located in the south-west of the Soviet Union, the city of Stalingrad (renamed Volgograd in 1961) was a centre for manufacturing + communications, as well as the doorway to the Caucasus region of Russia, rich in oil. Hitler believed that control of the Caucasus would make an enormous amount of oil available to Germany, whilst cutting off all access to the Northern and Central regions of the Soviet Union. The Caucasus was very desirable for these reasons, but it seems that Stalingrad was specifically targeted for its name. Taking its name from the leader of the Soviet Union, Stalingrad became symbolic for the morale and willpower of the Russian people, and therefore the Germans saw it as vital to defeat, and the Red Army saw it as vital to defend. The Battle began less than a year after the failure of Operation Barbarossa, meaning that Hitler was frustrated at not yet having achieved any significant victory on the Eastern Front. Hitler instructed General Paulus, commander of the German 6th Army, that the aim of the 1942 campaign was to reach Baku (located in modern-day Azerbaijan), driving the Wehrmacht across the south-west of the Soviet Union. What ensued in July 1942 was an intensely destructive battle; the life expectancy for Soviet soldiers on the Front Line was a meagre 24 hours. The Red Army was forced to use unforgiving tactics, drilling into the soldiers a mantra of “not a step backwards”. The The Wehrmacht deployed to Stalingrad had roughly 11,000 more soldiers than the divisions of the Red Army, and while the Soviets had more ground-level resources, they had roughly 100 fewer planes. The Luftwaffe gained and held air superiority from very early on in the battle, but by this point in the war it was stretched too thin; the German air force could not maintain such control in so many places at once. The battle was predominantly fought at a street level, with soldiers from opposing sides engaging in hand-to-hand combat. Sniper warfare was also utilised; Vasily Zaytsev – a skilled Soviet sniper – killed 225 people during the course of the battle, and was named a Hero of the Soviet Union on 22nd February 1943. The Wehrmacht often seemed more in control of the situation, but the Germans never held a strong enough possession that they could claim a victory. Territory won was often fought over again and lost within a matter of days. Mamayev Kurgan (a hill in Stalingrad city centre) was taken by the German Sixth Army on September 13th 1942, but the next day the Soviet 62nd Army launched a ferocious counter-attack, recapturing the hill on September 16th. Mamayev Kurgan was fiercely contested over during the course of the Battle of Stalingrad, and gradually became so worn down it was hardly a hill at all. By January 1943, there were approximately 1,000 pieces of bone and shrapnel per square metre on the hill. Crucially, the River Volga was never out of Soviet control, ensuring a small but steady flow of Soviet supplies. To tackle Stalingrad, the German Army Group South was split into A and B divisions: B was sent southwards to the city and the river Volga. Vasily Chuikov, commander of the Soviet 62nd Army, said of the battle climate: “approaching this place, soldiers used to say: “We are entering hell.” And after spending one or two days here, they say: “No, this isn’t hell, this is ten times worse than hell.” (Clark, 2011: 164–165.) Amongst both armies, hunger was a huge issue. Soldiers’ resorting to cannibalism was not unheard of, and many of the 10,000 horses taken to battle were killed and stripped of their meat. One of the striking aspects of the battle was the enormous contribution of the Soviet women. The 1077th Anti-Aircraft Regiment was comprised almost entirely of women. At the end of August 1942, the Regiment held the German 16th Army off for two days, defending the Stalingrad Tractor Factory. They managed to destroy 83 tanks and 14 aircraft before being defeated. The overall effort at Stalingrad was indebted to such regiments, who bought the Red Army time and helped exhaust the Wehrmacht. The Wehrmacht had already proven itself to be incapable of success during the long, harsh Russian winters, and so the Red Army decided to stage a winter campaign in Stalingrad, attacking Army Group South B in November 1942. Six Soviet armies succeeded in surrounding the Germans, trapping them inside the city. A rescue mission attempted by the Luftwaffe in December 1942 failed, sending supplies but never anywhere near enough to sustain the starving, diseased, and exhausted troops. The freezing temperatures destroyed German weaponry and morale. On January 24th 1943, Hitler told General Paulus – commander of the German 6th Army – that “surrender is forbidden” (Quigley, 2010: 142). Paulus, whose main charge was the northern section of the 6th Army, eventually surrendered January 31st (southern division), and General Schreck, leader of the northern section, followed suit on February 2nd, formally ending the Battle of Stalingrad. The Wehrmacht was humiliated, and lost its reputation of invincibility. 91,000 German soldiers were taken prisoner, 75,000 of which died of disease, starvation, or exhaustion within three months of surrender. What was left behind in Stalingrad was abject destruction; the landscape of the city in February 1943 was comparable to Hiroshima in August 1945. Once Stalingrad was secured by the Soviets, the German Army never won any more territory in Eastern Europe. Hitler, resigned to defeat on the Eastern Front, said “The God of War has gone over to the other side.” (Stone and Kuznick, 2012: 108.) Heavy losses were sustained, (both of manpower and land), and retreats began which ultimately ended in surrender of Berlin. This total defeat at Stalingrad instigated a feeling of resentment towards Hitler, who denied the possibility of surrender and left the soldiers surrounded in Stalingrad without any reinforcements. The Chief of the Army General Staff, Kurt Zeitzler, vowed to eat only as much as the surrounded troops, losing 26 pounds in two weeks, attempting to highlight the desperate situation to Hitler. He only succeeded in annoying the Fuhrer. 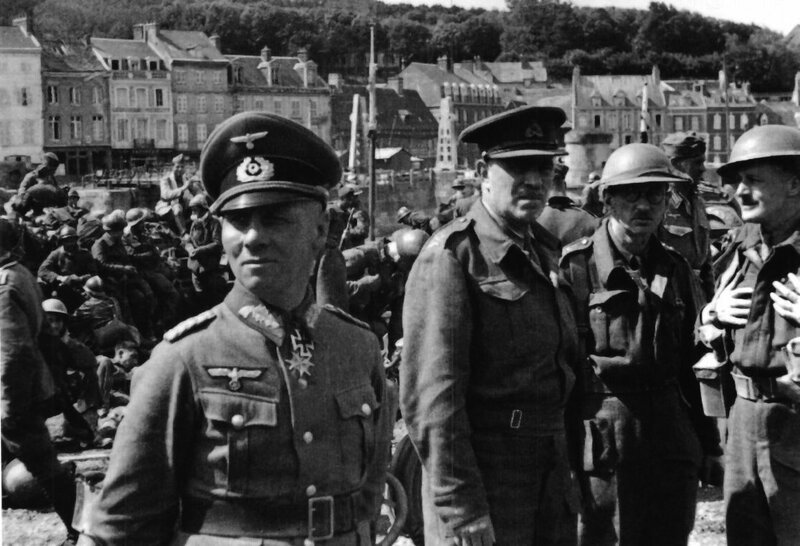 Hitler’s lack of control over his own war was beginning to show, and from 1943 onwards, the German campaign for victory became more and more fraught. 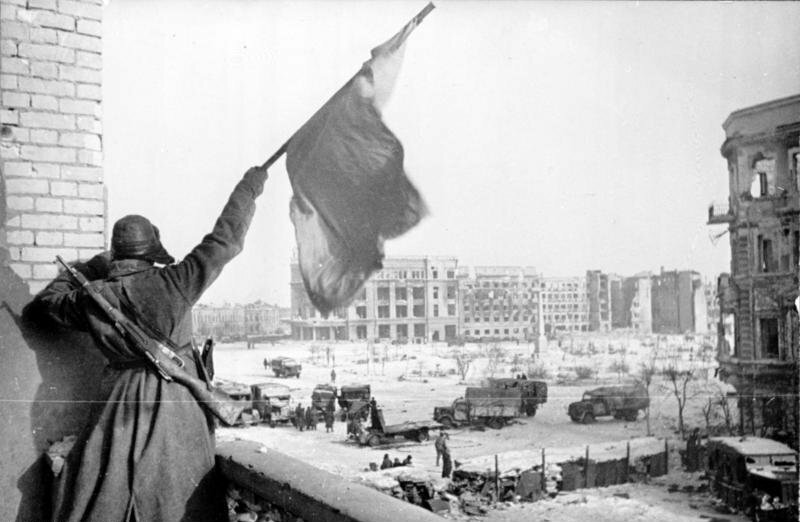 The Battle of Stalingrad is considered to have been the turning point of the war – literally. As a result of the defeat, the Germans had to turn back and retreat from the Soviet Union. The New York Times, two days after the German surrender, remarked that “Stalingrad has no parallel”, highlighting the significance of the battle, even then (February 4th 1943). The impact of the battle was so great that Germany observed three days of national mourning after the surrender. At the 1943 Tehran Conference, King George VI of Great Britain presented ceremonial swords to the citizens of Stalingrad to commemorate their bravery and sacrifice during the battle. These are now on display in the Stalingrad Museum in Volgograd. The battle changed the fortunes of the German army, and lay the foundations for the Allied victory. “After Stalingrad the question was how and when the war would be won, not whether it would be won.” (Roberts, 2013: 5). Geoffrey Roberts, 2013, Victory at Stalingrad: The Battle that Changed History. Abingdon: Routledge. New York Times, February 4th 1943. Stone and Kuznick, 2012, The Untold Story of the United States. New York: Gallery Books. Marilyn Estes Quigley, 2010, Hell Frozen Over: The Battle of the Bulge. Arizona: Author House. Lloyd Clark, 2011, Kursk: The greatest battle: Eastern Front 1943. London: Headline Publishing Group.